Lily Answers: Can I Use a Sleeping Pack Everyday? Our licensed aestheticians get some frequently asked questions about KBeauty, skincare and more. In this ongoing series titled “Lily Answers” our resident skin professionals answer our most frequently asked questions so you can be totally radiant! Have a question, leave us a comment below! Maybe, it depends on the type of masks you use. Sleep masks are a great multipurpose way to get the skin of your dreams while you snooze. 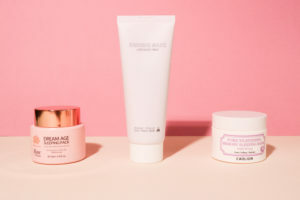 They can be used in lieu of your moisturizer which is the final step of your night time routine, or in combination based on your skin condition and needs. Depending on the type of mask, they can be used either on daily or a couple of times a week. Hydrating masks can be used daily to give skin a whopping dose of moisture where as clarifying masks should be used only a couple of times as it can be too drying if used daily. Below, we’ve rounded up some of our favorite overnight facials, no matter your concern. If you have dry, sensitive skin, then your go-to should be the Dr. Dream Age Sleeping Pack. Rosa Centifolia Flower Water conditions skin for a smoother, silkier texture and clearer complexion. Shea butter and argan oil ensure long-term hydration for plump and youthful skin. Niacinamide brightens dark spots and hyperpigmentation which are some of the most tell-tale signs of aged and aging skin. Aloe and hyaluronic acid provide moisture to the skin itself. Rosa Damascena stem cell extracts encourages skin rejuvenation for more lustrous and lifted skin. This sleeping pack locks in moisture overnight and slowly yet effectively delivers all the potent active ingredients to the skin as it heals itself from daily fatigue so you can wake up to totally renewed skin. We’ve been there, the vicious cycle of applying spot treatments to a blemish and then dealing with the flakiness that follows. Stop the cycle with this pore purging mask (Eco Your Skin Lavender Bedside Mask) which doesn’t leave skin feeling tight and dry. It gently exfoliate and reduces oil via beta hydroxy acids. To counter the dryness that often comes with salicylic acid, the addition of lavenders helps soothe skin (and we also can’t get enough of the calming scent which helps lull us off to sleep). Milk proteins and salicylic acid buff skin so it feels smoother. We especially love using this because it helps prevent breakouts in the first place. This sleeping mask is lightweight, matte and non-sticky so it’s perfectly comfortable to sleep with. Use two to three times as a week. This luscious jelly (Caolion Pore Tightening Memory Sleeping Pack) springs back into it’s original shape due to it’s memory form technology. Beyond being completely mesmerizing to use, the formula includes witch hazel which reduces inflammation, tightens pores, and balances oil. Think of witch hazel as nature’s acne spot treament, it’s a natural antiseptic that targets acne-causing bacteria. Allantoin and lactobacillus stimulate healthy cell turnover for softer, younger looking skin. At this point, if you’re freaking out that your skin will feel like leather, fear not. Shea butter helps seal in moisture while antioxidant rich green tea protects skin from environmental damage and even prevents further damage from being done. Use twice a week to keep skin balanced and tight.